The Medical Council will not send a team of specialists to Wat Dhammakaya to examine the health conditions of Phra Dhammachayo, the abbot of the temple. 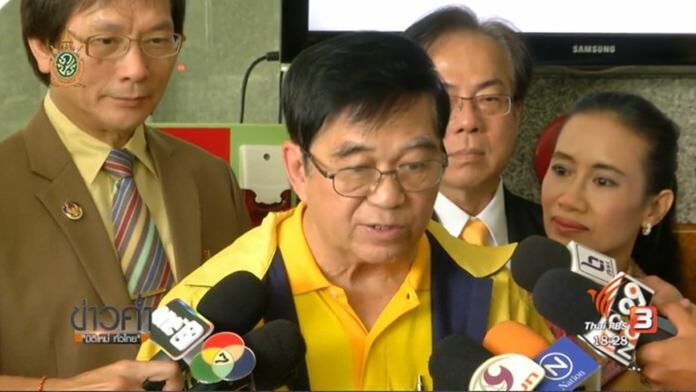 Medical Council president Dr Somsak Lolekha said Thursday that the council had officially received a letter of notification from the temple asking for indefinite postponement of the visit to the temple by a team of specialists from the Medical Council. The temple also said in the letter that the proposed examination by the specialists from the council would not have any bearing on the case against Phra Dhammachayo and that it did not want to put pressure on the council which is not a party in the conflict. Dr Somsak said he interpreted the letter as a wish from the temple to cancel the specialists’ visit and, therefore, decided not to send them to the temple. Regarding the medical certificate issued by Dr Siripong Pattanathanavisut, deputy director of the army’s Panurangsee hospital in Ratchaburi for Phra Dhammachayo, Dr Somsak said that a panel would be set up to investigate the issue and Dr Siripong would be invited to testify. The council will also ask for Phra Dhammachayo’s medical record from Saha Clinic Rattanavech. Wat Dhammakaya has claimed that it has a medical certificate from Panurangsee hospital confirming that its abbot was sick and could not leave the hospital to acknowledge the charges lodged by the Department of Special Investigation. The Medical Council is empowered to demand medical records from all state-run and privately-owned hospitals and clinics. Any doctor who issued a medical certificate for a patient without actually treating the patient may have his/her license suspended or revoked for breach of code of conduct.